Been packing up bundles of goodies for women both here and abroad. First, I entered Crazycatladymel’s annual birthday contest by sending yarn to women at Interim House, a transitional housing program in Philadelphia. The prize is yarn hand-dyed by the crazy cat lady herself. Go see her gorgeous Urban Legends yarn with a hilarious names for each colorway. And although I'd banned myself from any unnecessary spending, I determined that it was necessary to assemble and ship an Iraqi Bundle of Love. A soldier in Iraq is collecting bundles of fabric, yarn and knitting/sewing supplies to “surge” into the area where he is stationed near the end of his tour. Bundles should be mailed by September 7th so that they will arrive in time to be distributed during the festive celebrations at the end of Ramadan. Details and instructions are here. I will send you the APO address- just comment and ask. There is still a week to get yours in the mail! Don’t you think that this is a much better kind of “surge” that the ones we have heard about so far? My bundle includes a shower curtain, a vintage sheet, a tablecloth and some large and small cuts of fabric I have had forever. 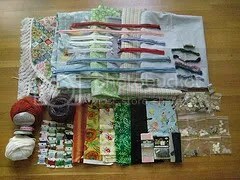 Also enclosed are zippers from clothes I have refashioned, buttons from the men’s shirts used for a quilt and oddments of yarn, trim and embroidery thread. Believe it or not, I was able to cram it all into a large APO flat rate box. I’m mailing these out as part of a larger decluttering project to make way for Gwen’s new bedroom. She will be moving to a bigger space and getting an awesome set of retro mod vintage furniture hopefully this week! This entry was posted on August 31, 2009 at 11:50 am and is filed under Uncategorized. You can follow any responses to this entry through the RSS 2.0 feed. You can leave a response, or trackback from your own site.